It’s been a few months since we last heard news about The Legend of Zelda: Hyrule Historia: and, if you’re like me, you’ve been waiting nearly half a year since the news first broke. Finally, after 25 years, we fans now have the definitive take on the franchise, the characters, and the timeline. But, is the Hyrule Historia the book of Revelation we hope it to be? Book-ending these sections is a very special introduction and afterword by legendary Zelda and Nintendo creators, producers and directors Shigeru Miyamoto and Eiki Aonuma, respectively, and a “Games Catalog” section that shows the release history of each game that has ever come out in the series. At the very end there’s a bonus comic, and in true manga fashion it actually starts from the back cover of the book, and is read backwards, and right to left. The comic is actually quite special, touching on an era of the Zelda franchise never seen before. As the name suggests, The Legend Begins: The World of Skyward Sword section is entirely devoted to Skyward Sword: here you’ll find concept art, designs, ideas, and background information on characters, enemies, towns, and more. Pretty much every aspect of every thing you can think of in Skyward Sword is broken down, detailed, and showcased as wonderfully as a behind-the-scenes featurette in the extras of your favorite DVD. The History of Hyrule: A Chronology section is the meat of Historia, and, let’s be honest, the main reason fans of the series want to read this book so bad. 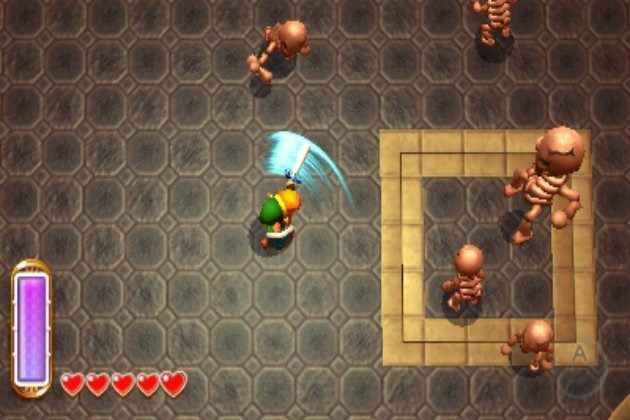 Here, the much coveted explanation of the official timeline is explored and detailed in full, taking readers from the beginning of the Zelda universe to the end of the events of Ocarina of Time , and then — after the timeline branches into three — taking fans through each of the three new timelines, one by one. This Chronology is vital to the franchise, especially since fans have been spending years debating the structure of the timeline and which games belong where in the grand scheme of it all. If you’re new to the Zelda universe, trust me when I say that there as many theories on the Zelda timeline as there are theories on quantum mechanics. But I’ll get back to this in a bit. The last major section, Creative Footprints: Documenting 25 Years of Artwork is a nice little ode to the entirety of the franchise, showing the evolution of character designs as they developed from the original Legend of Zelda game all the way to Spirit Tracks. This is a nice addition, and really shows you how not only the characters and designs developed, but how the series as a whole developed and became what it is today. 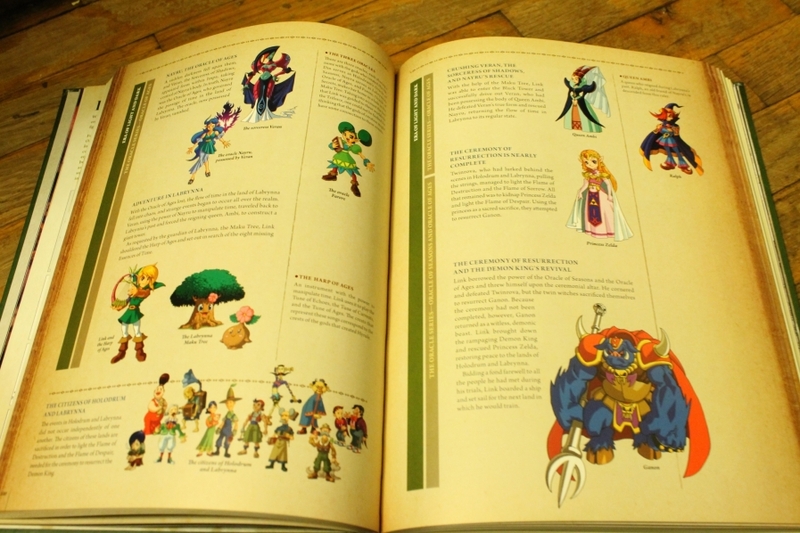 All of these are great: but is it enough to make the Hyrule Historia great? Well, that depends on your idea of what this book should entail. You see, for what’s been unofficially referred to as the Zelda Compendium by fans, this book shouldn’t really be considered as such. It’s the idea that this book is going to be some massive, insightful encyclopedia that may upset some hopeful fans when they realize the book is only 280 pages. This doesn’t make Hyrule Historia bad: it never said it was a Compendium. So don’t expect it to be as ridiculously fact-laden as a DK publishing book. What Hyrule Historia does great is explore and detail the timeline. And honestly, that’s what most people want this book for in the first place. That’s what the book was really made for. 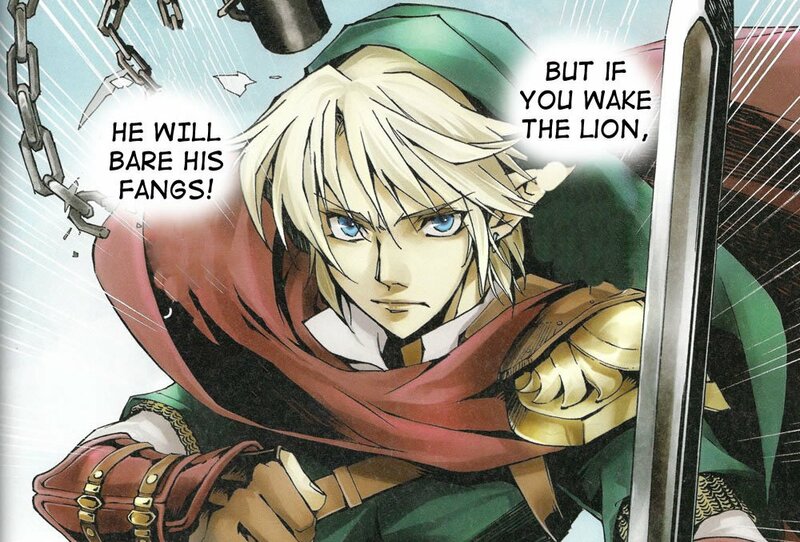 It’s called the Historia, not Learn What Link’s Favorite Color Is. And whether you’re a longtime fan who has played every single game, an on-and-off fan who’s dabbled in the series here and there, or a complete newcomer to the mix, Hyrule Historia‘s Chronology is a great place to start. And since Historia‘s importance hinges so much on the success of the Chronology, it’s a small wonder that the Chronology didn’t start off the book in the first place. After all, this is where the most answers are. It’s deep, provides tons of little anecdotes and sidebars on characters, places, races, items, and even the alphabets of various eras. In fact, it’s presented so organically, so elegantly simple, that it felt like I was actually reading a textbook based on some foreign land’s history. 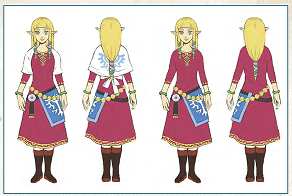 While I won’t detail the timeline here (by the goddess Hylia, I have but so much space to write!) you can rest assured that every game has been put into the timeline (except Link’s Crossbow Training), and that the timeline actually makes sense. 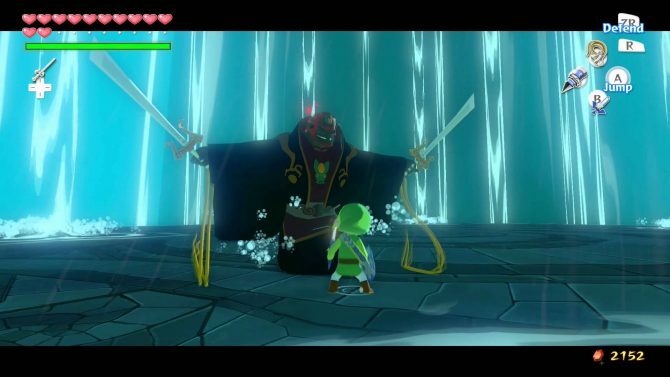 Most fan theories based the Zelda series on a two-timeline path, and when Nintendo released news that the Zelda franchise existed through three, there was confusion and denial. 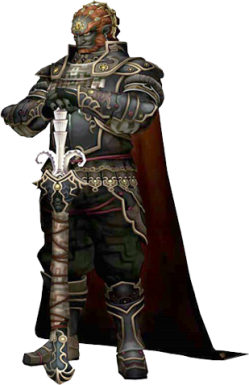 Worst yet, when Nintendo said that the three timelines were based on whether the hero defeats Ganondorf at the end of Ocarina of Time, or fails, there was an uproar. Unlike games like Heavy Rain where “there is no gameover screen” and player failure still continues the story, Ocarina of Time never had such a system in play. At the end of the game, players either won, or lost, and had to restart the last battle. But rest assured: for the purposes of the timeline, the three paths make sense. 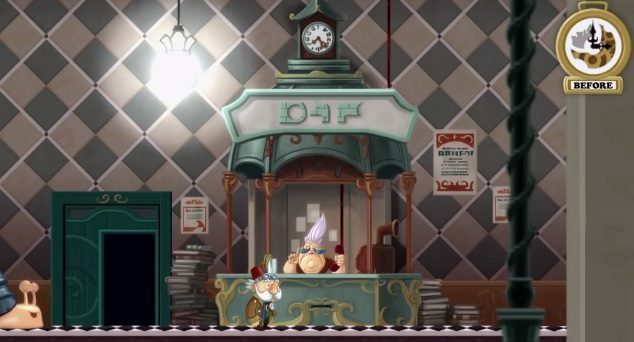 I’ve had substantial time to explore every minuscule detail, and at this point I can’t even picture the timeline existing in any other way. Hyrule Historia‘s biggest problem is that once you move on from the Chronology, there doesn’t seem to be much else that satisfies in the book. This isn’t to say there’s no sense of quality, or that there will be any lack of appreciation, but when you have this one section that gives so much, this one section that really pulls readers into this unique, immersive universe, everything else from then on seems… lacking. Or mediocre at best. 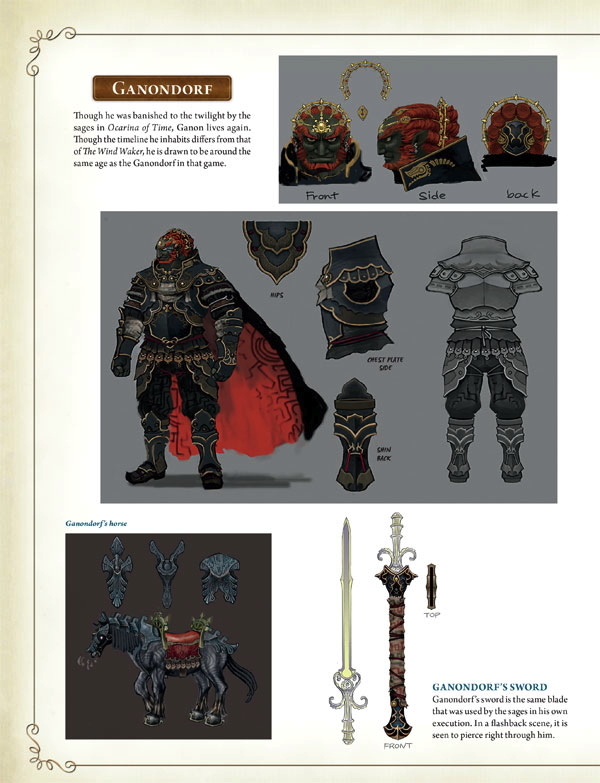 For instance, while the “Changes in Character Design” feature showcases the design evolution of Link, Zelda, and Ganon over the years, and the Creative Footprints section details some changes for the franchise over the years, it would have been nice to have an actual Bestiary section that explored Link’s greatest enemies. There’s some art here and there, but there’s no attention given to longtime monsters like the Lizalfos, and no mention at all of the Like-Likes. None. Me no like-like. Following that idea, where’s the Armory section? For a guy who has relied on a variety of devices over the years, one would expect an Armory or Arsenal section detailing all of the weapons, items, and magic the various Links have had to use over the eras. Of course, I can understand omitting a section that details the difference between the Ultimate Sword and the Magical Sword, but not having even a few pages dedicated to the hookshot, the ocarina, or the bombchus is a travesty. It would have been nice to get a little mythology behind the items too: for instance, where does the Roc’s Feather and Cape items come from? Was Roc a divine or demonic bird who molted everywhere? And where the hell did the Hover Boots from Ocarina of Time come from? Finally, it would have been nice to see a section on the various races that populate the various Zelda games, especially since there is mention of some races evolving over time, like the aquatic Zora into the bird-like Rito. It’s little things like this that would–perhaps–be more fulfilling to a book detailing the legacy of a franchise. 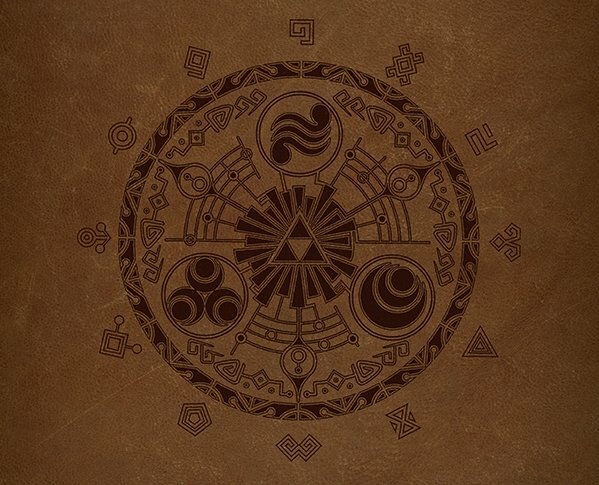 But, then again, perhaps this is something that is more befitting of a Zelda Compendium than a simple Historia. 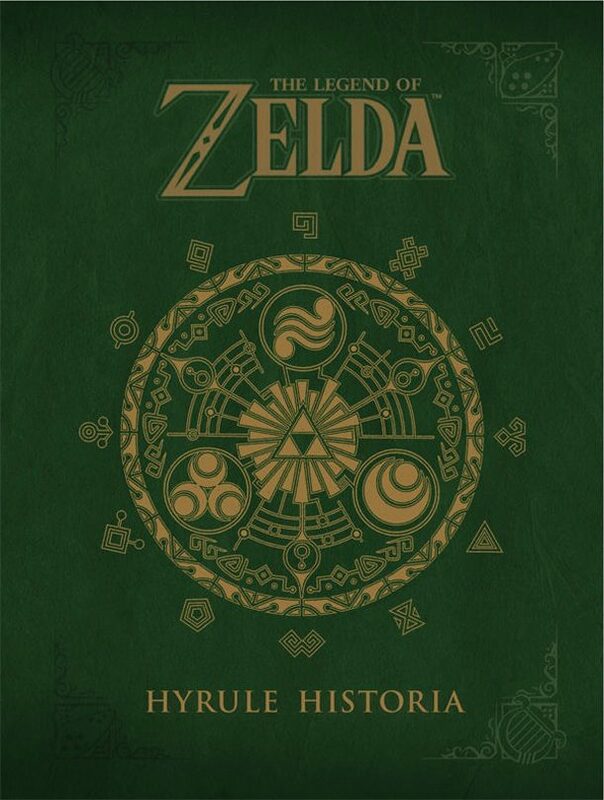 Which, assuming the Hyrule Historia sells well (and considering that the book shot to the top of Amazon USA’s best-seller list with pre-orders alone, I feel confident in this assumption), hopefully the Historia will lead to a more fuller, encyclopedia-like Compendium that is even more rich with detail. The Legend of Zelda: Hyrule Historia is a great buy. The book feels great, looks great, is sturdy, and will make for a great placeholder on your bookshelf of geek culture. 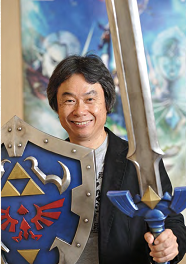 While it may be lacking some supplemental content, the book delivers on what it was created to do: provide readers with a highly detailed look at the Zelda timelines and celebrate the series after 25 years of games. Whether you’re completely new to the series, or a Zelda veteran, this is the book for you; this is a book that will connect your heart to the Zelda Universe. And it will make you want more of it.